Lane Technical College Prep High School is a public high school on the north side of Chicago. Over the years, it has become the repository of a large important collection of artwork. This collection includes murals from 1909-1913 that were commissioned for the original school building. The current building dates from 1934 and was gifted with a large collection of murals done for Chicago’s Second World’s Fair, the Century of Progress. Between 1934 and the early 1940s, Lane Tech received murals, frescos, and sculptures that were created or acquired with funding from the Federal Art Project (FAP) which was created by the Works Progress Administration (WPA). 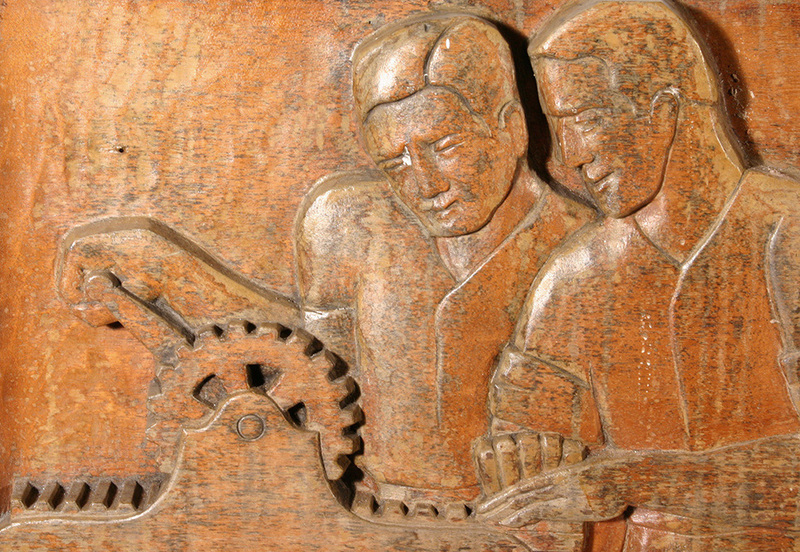 There are two pieces of wood sculptural relief in the library that were acquired with assistance from FAB funding. They were designed by Peterpaul Ott between 1934-1938, though there are some questions as to how much of the carving he did and how much was done under his supervision. Both reliefs are composed of carved mahogany panels 6’-0” W and 2.5” thick. The sculpture on the east wall, “Controlling of the Elements,” is made up of 5 panels that combine for an approximately height of 15’-0”. The west wall, “The Evolution of the Book,” is made up of 7 panels and is approximately 15’-0”. Recently, there was failure of the roofing over the east wall sculpture, “The Evolution of the Book.” Water ran down the face of all seven panels in various amounts and degrees. 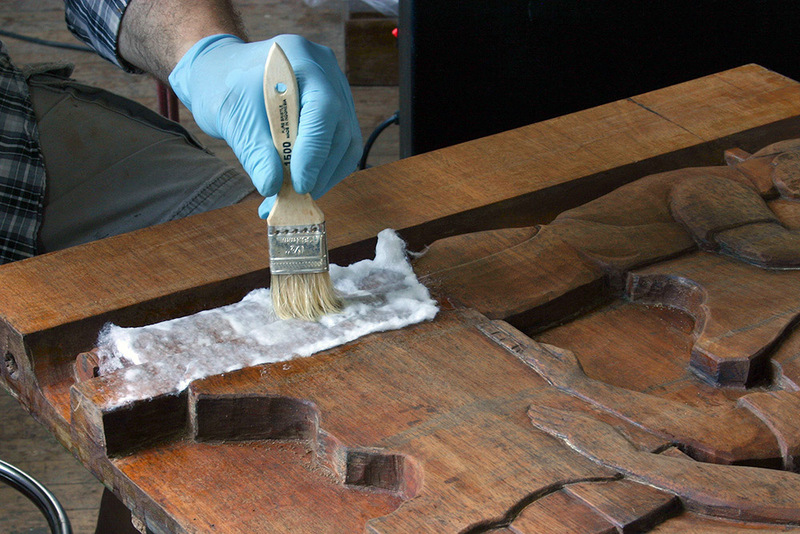 The water severely damaged the shellac finish, leaving it streaked and even removed it in some areas. If this would have been the only damage, the treatment would not have been easy, but fairly straight forward. Re-amalgamation with alcohol and selective re-coating would have taken care of the damage, just as it did in the earlier conservation. The new problem was the water from the roof also carried black material that was then deposited in the deep open grain of the mahogany wood. These deposits were very visible and were unevenly deposited across the panels following the path of the water. Poulticing with a wide variety of solvents proved mostly ineffective and in many cases, drove the deposits deeper into the wood substrate. Bleaching mainly camouflaged the deposits while invasively altering the wood color. Stripping would remove the deposits but would completely remove the patina of the wood, and would require completely re-coloring and recoating all of the panels. Manual removal with sharp instruments removed the deposits but was very time intensive and had to be carefully monitored in order not to change the grain pattern and color. The final treatment ended up using all of these methods in varying degrees in various areas. Extensive washing with alcohol and naphtha combined with manual removal treated much of the deposits but also caused some color alteration. Some of the more difficult areas were selectively bleached or stripped which again caused some color change in the wood. Color matching blending the variously damaged areas with undamaged areas was done with variously toned shellacs brushed and padded on. Wax was added and buffed to a proper patina.